Bind consists of a combined TV/VCR unit bound to an open book by steel cable. 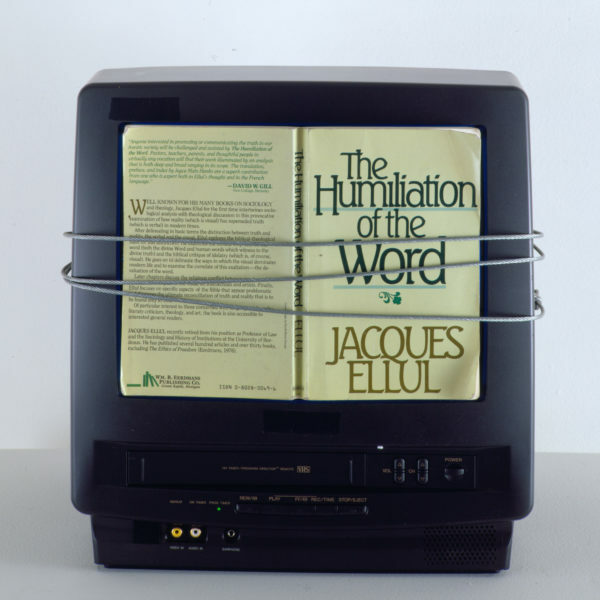 The book's pages are pressed against the monitor's screen, covering all but the very edge, where light is seen flickering to the rhythm of words spoken from the book. All silences between sentences, words and syllables have been truncated, creating a continuous "automated" reading by the monitor's "scan." 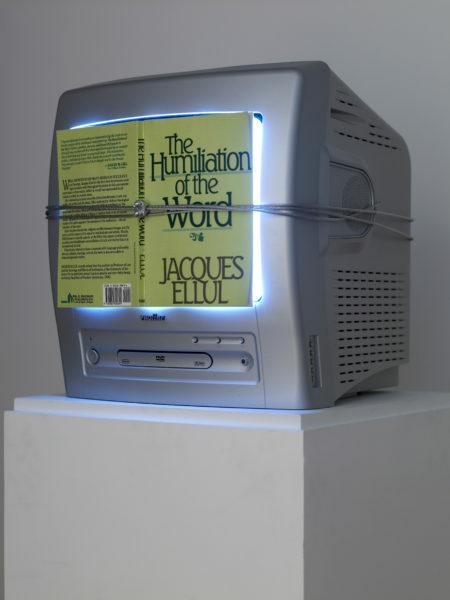 The book, entitled Humiliation of the Word, by Jacques Ellul, discusses the effects of technology, images and television on the discourse of the mind, particularly the relationship between thought and speech. Gary Hill: Selected Works and catalogue raisonné. Wolfsburg: Kunstmuseum Wolfsburg, 2002, GHCR 89, p. 187. An example of this work was first exhibited by the Donald Young Gallery at Art Chicago 1995, Chicago, Illinois, May 11 – 16, 1995. Solo exhibition. Galleria Lia Rumma, Naples, Italy, March 7 – June 31, 1996. “From Ex-Libris To Home Page,” Paço das Artes, São Paulo, Brazil, August 6 – September 9, 1996. “Hill(scape),” Extra Microwave Media Art Festival (organized by Videotage), Hong Kong Cultural Centre Foyer Exhibition Area, Hong Kong, January 14 – 31, 2001. Donald Young Gallery at The Armory Show, New York, New York, February 22 – 26, 2001. “Gary Hill: Selected Works 1973 – 2003,” Museum of Contemporary Art, Taipei, Taiwan, May 2 – August 24, 2003. 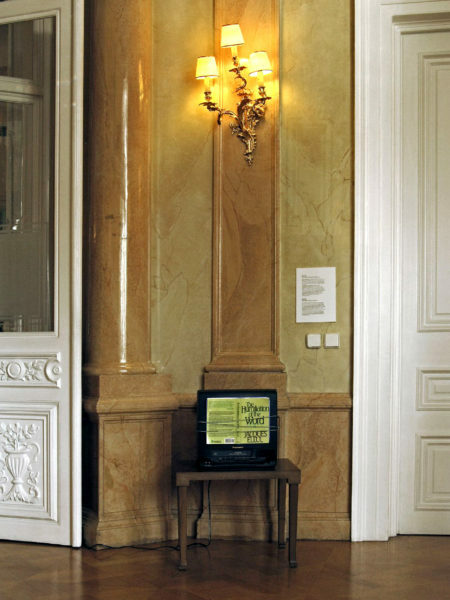 “Behind Closed Doors,” Katonah Museum of Art, Katonah, New York, May 29 – July 11, 2004. “Her(his)tory,” Museum of Cycladic Art, Athens, Greece, June 4 – September 29, 2007. “Die Lucky Bush,” The Museum of Contemporary Art Antwerp (MuHKA), Antwerp, Belgium, May 22 – August 17, 2008. “Bookish,” Corbett VS Dempsey, Chicago, IL, July 25 - August 23, 2014. Van Assche, Christine. “Six Questions to Gary Hill.” Parachute 84 (October, November, December 1996), p. 42. Dantas, Marcello. Gary Hill: O lugar do outro/where the other takes place. Rio de Janeiro: Magnetoscópio, 1997, p. 12. Hill (scape): Gary Hill’s video screening, performance and installation exhibition. Program notes. Hong Kong: Videotage, 2001, pp. 1, 2, 9. Gary Hill: Selected Works and catalogue raisonné. Wolfsburg: Kunstmuseum Wolfsburg, 2002, pp. 187. Unfolding Vision: Gary Hill, Selected Works 1976 – 2003. Taipei: Museum of Contemporary Art, 2003, pp. 17 – 18, 52 – 53. 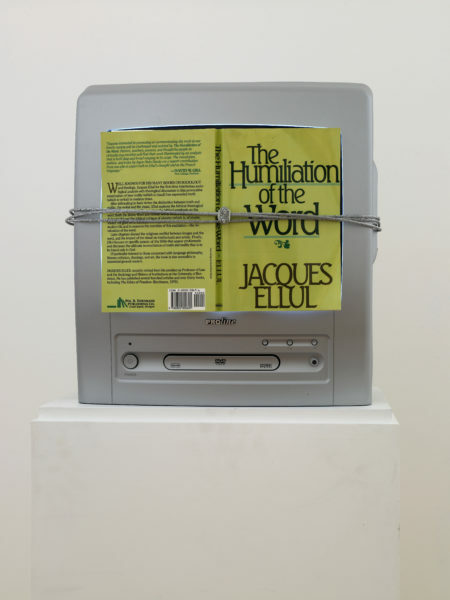 Texts read by the artist are excerpts from Jacques Ellul, The Humiliation of the Word. Grand Rapids: Wm. B. Eerdmans, 1985.